The shape of the economy is changing under our feet, and Senator Mark Warner (D-VA) and cyber business leaders in Loudoun aren’t sure we’re keeping up. 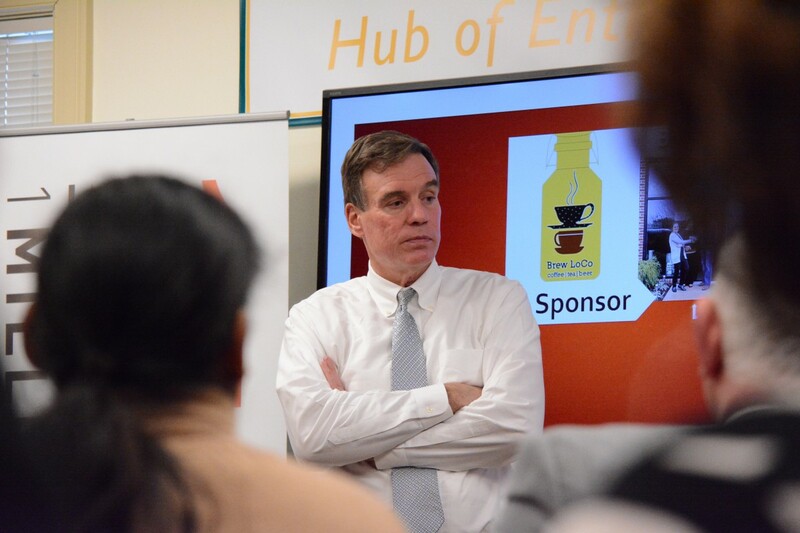 That was the takeaway message from a roundtable discussion Tuesday at the Mason Enterprise Center in Leesburg, where Warner met with business leaders to talk about cybersecurity and the “gig economy”—services like Uber that let people use their cell phones to monetize their cars, gig work, and time. The gig economy is hard to nail down. In fact, nobody’s even yet agreed on a name for it—some people call it the on-demand economy, for example. “You know you’re in the right spot when they don’t even have a name for it yet,” said Warner, who was a venture capitalist before entering politics. He said the gig economy started with outsourcing. Companies began shedding employees who weren’t essential to the company’s central function, and hiring employees on a per-job basis rather than keeping them on as salaried or hourly employees. Warner cited a study published in January that found 22 percent of the adult population had worked on an on-demand basis. This presents a problem for employees and employers: the federal government doesn’t yet have a good way to classify these employees. “The law only looks at you in two buckets: You’re a 1099 independent contractor, or you’re a W-2 employee,” Warner said. This means that on-demand workers slip through a big crack in social safety nets. Benefits like insurance and retirement that are traditionally attached to a job are usually unavailable, and employers who try to chip in to help with those costs expose themselves to litigation. Warner said the solution involves reinventing the American social contract. “What we’re looking at now is, maybe we need to come up with a whole new set of benefits that travel with the person,” Warner said, wondering how that could be balanced with flexibility, freedom, and uneven income that characterizes gig work. One of the handicaps, he said, is that the government doesn’t have good data on the gig economy. He said the Bureau of Labor and Statistics has begun a new look at the gig economy. “I’ll make you a wager: whomever the next president’s going to be, this is going to be one of the most significant issues that our country’s going to have to address,” Warner said. But the first topic on the minds of the executives and elected representatives in the room was cybersecurity. John Wood, CEO of Telos Corporation, agreed whole-heartedly, and said the problem requires a change in the way we think about cyberspace. Cybersecurity also lends itself very well to asymmetrical warfare, in which small groups, often unaffiliated with any recognized government, can stymie efforts by large governments, which can’t bring their superior numbers and force to bear. “A group of hackers in Kiev could have as much potential as a whole country, in some cases,” Warner said. 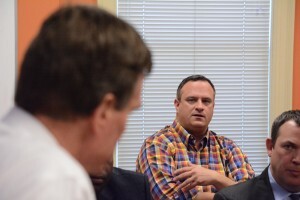 And John Binkley, who serves on the Town of Leesburg’s Technology Commission, giving cybersecurity students practical experience is risky in the current legal environment. But as Loudoun well knows, cyber and cybersecurity jobs are appearing faster than they can be filled. There are 200,000 unfilled cyber jobs in America, and Warner said more of those are in Virginia than anywhere else. Binkley and others agreed that, with the dearth of employees to fill the glut of jobs, workforce development will be crucial to American cybersecurity. Warner mentioned recent proposals to teach coding as a language in schools. “It’s something that puts a stake down and says to the world: We’re ready for the future,” Warner said. But Virginia isn’t yet seen as the place for tech innovation. The Department of Defense and other federal and private offices look first to the elephant in the digital room—Silicon Valley. What’s more, California is fertile ground for new tech business. Tech startups in Virginia face a number of hurdles: lowest-cost competition from larger companies, significant regulatory and paperwork hurdles for government contracts, and a lack of access to capital for small businesses. 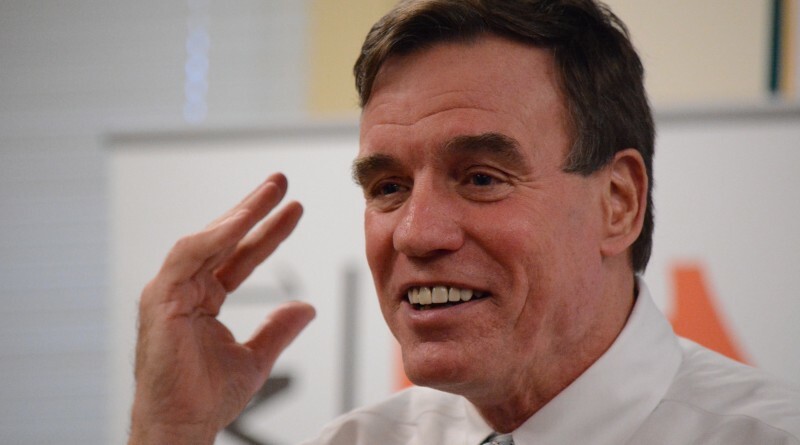 Warner goes back to Washington with several ideas: a private startup fund for new cyber businesses, rules that allow workers more flexibility for workers switching back and forth between the public and private sectors, and a better training and career pipeline through public schools, community colleges, and universities. “One of the challenges from today is going to be, how do you make sure that that small business voice is heard?” Warner said. This is an extremely important issue. Not only do we have a shortage of folks in cybersecurity, as John Wood noted, but Sen. Warner has been discussing the need for Virginia to become a leader in this area from an economic development standpoint. The fact is the federal share of the job market is shrinking due to sequestration and a host of other factors. The DC area (Maryland , DC, Northern Virginia) has no brand like other regions. However, we could really brand DC as a Cybersecurty mecca thus attract the companies and jobs to this region. Getting students interested in this field is critical, too. That’s where GMU and other public universities should come into the picture.